I’m sure you’ve heard the old adage, “No news is good news.” The fact is, no news isn’t good news; it’s just bad public relations. The good news for us is you’ve most likely heard of public relations or “PR” before. The bad news is you might negatively associate PR with things like crisis, spin doctoring, or even propaganda. We certainly hope this isn’t the case, but if we’re completely honest, public relations does have a bit of a public relations problem. If the thought of PR in connection with your school leaves you feeling uncomfortable, we hope this article will change that. You see, we have this theory that schools avoid public relations because of those negative cognitive associations. But give us five minutes of your time, and we’ll explain what (good) public relations really is and why your school shouldn’t be without it. Let’s focus on a couple of the key terms from this definition and how it applies to your school communications. Communication is the exchange of news or information; strategic communication is the intentional, planned, and executed exchange of information and news. That is key in school public relations. Communication that is frequent, consistent, and meaningful says to your audience, “We care, and we’ll show that we care by keeping you informed and making sure you have all the information you need easily accessible.” This kind of message establishes a rapport of trust and respect with your audience. The second key phrase we’d like to discuss is “mutually beneficial relationships.” But first let’s talk about your publics. There are students, parents, teachers, and staff to name a few. Each public has different nuances to their communication, involvement, and needs with regards to their relationship with your educational institution. Understanding your audience and actively working on building positive relationships is the foundation of good school public relations. You can’t just provide news and information though; that would be too easy. When just the organization is talking, we call it one-way communication, and it’s not the best model for good relationships. Have you ever had one of those friends who just talks on and on and never takes a break to listen to what you have to say? Yeah, that isn’t a very good friend, is it? To establish mutually beneficial relationships with your publics, it’s important to provide them with opportunities to give you feedback and engage them in back-and-forth conversations that establish connections. Good school PR relies on listening as well as communicating; this is called two-way communication. Or when you listen to and fulfill the needs and concerns of your customers, you could just call that good customer service. We live in a time when customer service is king, and your school’s customer service is no exception. Consumers today have options for every service imaginable, education included. So how do they make decisions like where to send their kids to school? They talk to their friends and family. They turn to their social media platforms and ask for recommendations and referrals. They look at your website. They look for reviews of your schools on places like GreatSchools.org. You can’t buy a good reputation, and you can’t advertise for it; you earn it through your relationships with your publics. Our schools are doing a great job educating, but no one really knows about it. Remember how we said “no news is not good news?” John D. Rockefeller said, “Next to doing the right thing, the most important thing is to let people know you are doing the right thing.” Our schools need to do a better job at keeping their audiences apprised of the things they do on a daily basis. Holding teacher development training or dedicating an entire week to drug-free education may seem mundane to you; however, those little things you do on a daily basis are going unnoticed by your audiences, unless someone takes the time to point them out. A common misconception of school PR is that you only need it if you have a crisis. But that isn’t the case. If you try to establish good relationships with publics in the middle of crises, you aren’t going to get far. On the other hand, if you’ve put in the effort to build trust and respect with your audiences when times are good, they are going to give you the benefit of the doubt when a crisis hits. And you’ll have established habits of consistency and transparency that are key in dealing with crises. Public relations for schools is just as important, if not more important, when there is good news to share. We tell you how to engage in good public relations in our free eBook download at the end of this blog, so let’s take a moment here to talk about what good school PR can do for you. Careful PR management supports a brand identity; that is, it will support your school’s identity. Branding is the overall look and feel of your organization. It includes your mascot, the colors and typeface you choose for your materials, the tone of your school communication, etc. Your brand should create a distinct and memorable impression. Your branding also includes your messaging; that’s where PR steps in. What are your school mission, vision, and/or values? Do you truly uphold and communicate them with every effort? Or is it just a slogan on your “About Us” school website page that no one really knows? Good school PR not only disseminates your message to your audience but engrains it in their hearts and minds. Your communication efforts, as we mentioned before, establishes trust with your publics and, additionally, it can establish your organization as the experts in education in your community. Good branding plus public relations can result in increased enrollment and customer loyalty. It’s easy to connect with your primary publics, the ones already associated with you, such as parents, teachers, staff, and students. It’s a whole other ballgame to connect with your secondary publics, the ones who don’t have direct contact with your school and may not understand or be aware of their connection (as is the case with many taxpayers). Your school’s public relations is the key to reaching these audiences (parents of prospective students, taxpayers and community members who don’t have children in schools, etc.). School communications should make your meetings accessible so that more than just parents of existing students can attend. That effort at PR can connect your school with the community as you publicise well in advance to allow people to adjust their schedules to attend and allow time for audience discussion. Your messaging and relations will give you a chance to communicate your school’s fiscal needs to the taxpayers and give them the opportunity to know how they can support you. Marketing and public relations have a close, symbiotic relationship (discussed in-depth in our eBook), but they are not the same thing. Marketing your school focuses on promoting your school and increasing enrollment; whereas PR listens to your customers and creates meaningful content and services based on their preferences and needs. Marketing and public relations are cyclical processes that work together to bring in new students and retain existing students. One way it does this is by word-of-mouth marketing. Think of it this way—school marketing is what you’re telling your audience, and word-of-mouth is what your audience is saying to each other behind your back. If your school is using PR to listen and respond to your audience, then what you’re marketing and what they’re saying will start to align. 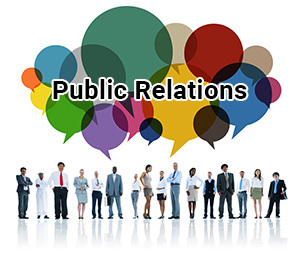 In summary, public relations are the messages you communicate and the relationships you establish with your publics. As you practice school public relations, you’ll improve your school brand, connect with your community, and boost your marketing efforts. Consistent, strategic messaging with the end goal of creating and nurturing relationships with your publics is key to your school's success. In other words, good public relations is the key to your school’s success.